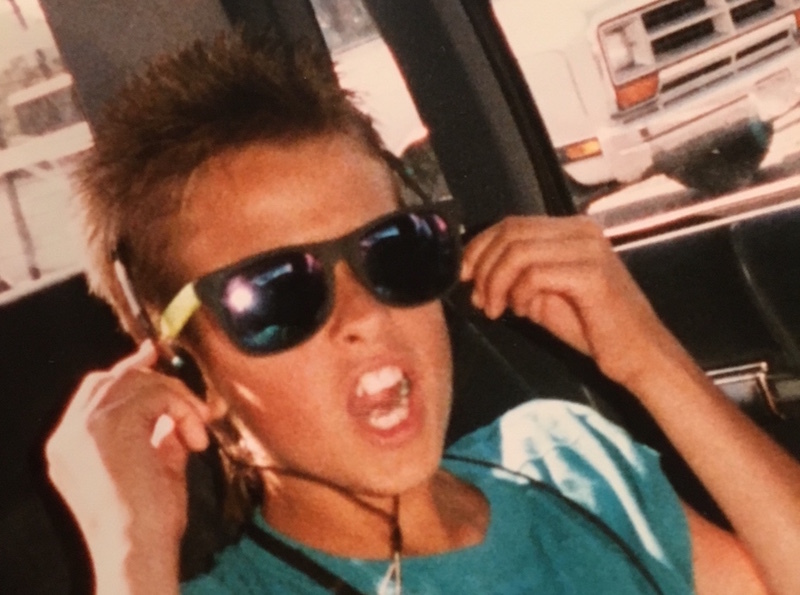 This is me rocking a spike, oversized glasses, and headphones that are either playing “You Can’t Touch This” or “Go West Young Man.” Also, that’s either an Ocean Pacific or Bugle Boys sleeveless T because, obviously, who covers up guns like that? But even then, I cared most about good stories. Back in early June, I sent my literary agent a text. We were expecting to hear a final decision from the publisher on Tuesday. It was Wednesday. I felt like so much depended on this. So many years. So many words. “Any news?” I asked in the text. In the dog days of August, circa 1985, I was a skinny 8-year-old reading The Lion, the Witch, and the Wardrobe on the farmhouse porch, waving away the flies. Cows mooed in the background. The thing I hated the most was mowing the lawn, or anything else that interrupted my reading. We had no air conditioning in that massive farmhouse, only a handful of huge box fans to move the warm air around, and on especially hot nights I’d sleep on the floor in front of one of them, the loud hum drowning out the world. I attached a sheet to the fan so that it blew up around me in a dome shape. It was like sleeping inside of a cloud. I read under that dome with a flashlight until long into the night, the pages flapping back and forth in the gale force. It was like my own world, my own universe. There was the smell of the farm, the scratchiness of the carpet, the weariness of my eyes growing heavy. There was nothing else. I devoured books in those days. I drank them down straight. The best of them left me in something like a buzzing stupor, and I wandered the farm for weeks after finishing, drifting through the beautiful trance they left me in. I sat by the creek, fishing, and my mind followed the water, meandered all the way to the sea. I felt a tangible ache for Narnia. I opened every closet twice, quickly, and peered deep into the darkness, hoping to see snow-laden branches or hear the voice of a faun. In college I dove deep into writing. It started out as journaling, moved into poetry, and occasionally stumbled into a few, halting efforts at novels. I spent afternoons beside the Yellow Breeches, a narrow stream that wound its way through our campus. I wrote in pencil then. Words and words and words in a little red notebook I found in the basement just the other day. The eroded red notebook was hiding between old yearbooks and containers holding floppy disks. The words are barely visible now, rubbed raw by all those years, all those moves. I wrote the first paragraphs of at least twenty novels that never went any further (I wonder about all of those characters, where they went, what ever happened to them). I wrote a fair amount on three novels, got far enough to realize I didn’t know what to do with the middle part. There was something about that section of a story that always felt awkward, always trailed off into mumbled plot lines that never recovered. I became bored writing them and figured that meant someone would get bored reading them. I set them aside or threw them away. I finished writing one novel in those days, very short. Very not-good. I might know where it is, but I’d rather not look at it. If I do find it, I think I’ll burn it ceremoniously. Maybe on a floating bier. My writing road, like most people’s, has been long and winding. For the last 17 years I’ve experienced mostly rejections: I was rejected from at least five MFA programs (at least five – I’ve lost track), numerous literary journals, countless agents, and a series of publishers. I’ve kept many of those rejections in a file folder somewhere. I don’t know why. Maybe because they’re like scars? Maybe because I still want to prove them all wrong? Maybe because they make up this long, winding road I’ve traveled? I broke into the publishing world seven years ago with the publication of a book I co-wrote, and that led to a lot of opportunities. In the following years, I self-published three books and co-wrote another fifteen, but my dream was still to have a publishing house publish my fiction. My own stories. Ever since I was 8 years old, under that sheet dome in the middle of the night, reading The Lion the Witch and the Wardrobe or A Wrinkle in Time, ever since then I’ve wanted nothing more than to make up stories, write them down, and have people read them. I don’t know. I’ll have to think about that one. Maybe it’s because, to me, that’s the most real sort of magic I’ve ever encountered. I want to do it, too. I want to make that magic. 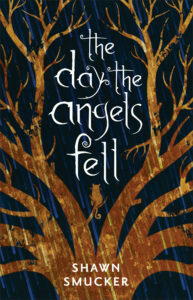 Four months ago, we started sending a book proposal for The Day the Angels Fell to publishers. That’s the book you all helped me self-publish through Kickstarter at the beginning of 2015. I think my agent sent the manuscript to 15 or 20 acquisitions editors. You can read about that process HERE and HERE. And that came with it’s fair share of rejections. It was a long, hard wait, and towards the end I got impatient. I felt like the road I was on had leveled out and would never change. I was ready to move on with my life, chalk it up as another failure. But my agent, Ruth, kept encouraging me. “Just give it a little more time,” she said. Then, a spark of light. An acquisitions editor liked my book. She loved it. She wanted her publishing house to take it on. We spent the better part of an afternoon talking with her, hearing her dreams for the book. I don’t think I said much. I was in shock. Someone who believed in my writing as much as I did? Someone from a publishing house who had fallen in love with something I had written? Tuesday came and went. By Wednesday, I still hadn’t heard anything. I sent Ruth a text. “I have good news,” she said. I sat there quietly as she told me the story. Revell, a division of Baker Publishing Group, was offering me a three-book contract which included re-releasing The Day the Angels Fell, publishing the sequel, and publishing a third book of fiction, to be determined. I was shocked into silence. I couldn’t speak. About ten minutes into describing the offer and what it meant, Ruth paused. She asked me a question. “Are you happy with this?” There was uncertainty in her voice. Maile was listening outside the door the entire time. As soon as I hung up with Ruth, she came flying into the office. I took a deep breath. I nodded. “Are you serious?” she exclaimed. I told her the details. About that time, Ruth forwarded the offer letter to me. When I initially read the first paragraph of The Day the Angels Fell, I was hooked. When one of our sales representatives read that same first chapter he emailed me immediately and said “this is something special.” Whether I’m reading what your fans are writing, listening to what my colleagues are saying, or am immersed in Sam Chambers’ world myself, I know that what you have here, in this book and in your writing overall, is exceptional. The offer letter was so kind, so encouraging, so affirming of everything I’ve always tried to do as a story-teller. I got to the second paragraph of the offer letter when I was overcome with emotion. I sat down on the floor in the office, leaned my head up against the door frame, and sobbed. “I don’t even know why I’m crying,” I finally said. She took the computer from me and finished reading the letter out loud, and I sat there listening. It felt like she must be reading a letter written to someone else. I couldn’t believe this was for me. I don’t think I ever would have gotten to this point without you, my kind and encouraging readers. For nearly seven years you’ve been reading my blog posts as well as the books I’ve co-written. Whether it’s the comments you’ve left, the emails you’ve sent, the reviews you’ve written, or the way you gave me overwhelming support when I self-published The Day the Angels Fell, your encouragement has propelled me forward on this journey. There’s a long, exciting road ahead. We plan to release a hardback version (hardback!) of The Day the Angels Fell in the fall of 2017 (I know! That seems so far away!). It will be freshly edited and come with a brand new cover. 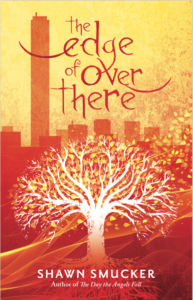 For those of you who have been waiting for the sequel, The Edge of Over There, we’re planning to include the first few chapters of that book at the back of The Day the Angels Fell. This is where I ask, once again, for your help. I cannot re-launch The Day the Angels Fell without your enthusiastic support. If you’re interested in being part of a fun group that will help me with the release of this book, sign up HERE. You’ll even receive a FREE ADVANCED COPY OF THE BOOK BEFORE IT RELEASES! 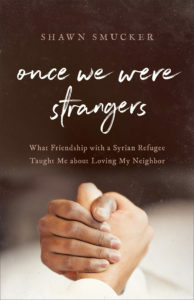 In exchange, we’ll ask only two things: please review the book online, and help us spread the word during its release. You’ll also receive updates on our progress and provide important input on various things as they come up in the design and planning phase. I’d love for you to continue to join me on this incredible ride. I promise I won’t email you more than once or twice a month. I won’t be sending these out in my normal newsletter, so if you can help with this book launch, please be sure to sign up HERE. Now that the spike of excitement has begun to level off, I sit back and I wonder. I wonder if I would have been in this precise spot, written this precise book, if I wouldn’t have received all of those stinging rejections through the years. I wonder if I would have met all the wonderful people I’ve met along the way if this opportunity would have fallen into my lap years ago. I wonder if we can ever write the stories we’re supposed to write without those times of deep sadness and disappointment, rejection and loneliness. I hope you’ll keep walking your path. I hope you won’t give up. If I can do it, you can do it. I am no writing prodigy, no natural born success. I am simply someone who insisted on putting one foot in front of the other for a very long time. Someone who, with a lot of help from my writing community, refused to cave to the voices that told me I wasn’t good enough. I wonder something else, too. I wonder what that little boy under the fan-and-sheet dome would think if he could have read The Day the Angels Fell. I wonder what dreams he would have had after reading it, what adventures he would have taken in the creek behind the church building. I wonder what he would have thought, looking up into the oak tree, the one struck by lightning when I was ten, the one that inspired the story in the first place. Maybe somewhere, that will happen. Maybe a kid (or an adult) will stay up late into the night reading about Samuel Chambers. 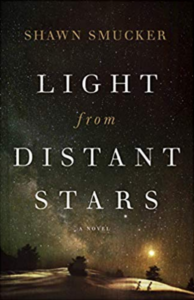 Maybe this book, this story, will somehow become tangled up in their life the way all those wonderful books I’ve read have become tangled up in my own. Remember, please sign up HERE to join the launch team and receive your free advance reader copy next spring/summer. For more frequent updates and other random stuff, you can “like” my Facebook page HERE. And whatever your current dream, keep going! Your post this morning was an answer to my very real insecurities about writing for publication. There are days when I write a FB post and then reread it and ask myself whatever was I thinking?! You have encouraged me – I only wish I had kept all of my rejections from many years ago when I first began my journey toward getting a novel published. I’m glad this could be an encouragement to you. Something that helped me through the years was learning to write and not look back. Create something, edit it, revise it, and then move on to the next thing (that will surely be much better!). This is not something I can always do, but when I can, it is a great source of comfort and self-confidence. First and foremost: so over-the-top happy for you. And the timing thing? Just wow. Timing is in the Awesome Zone. Like Judy, I woke up this morning thinking, “I’m writing…why?” (Judy: If you’re reading, I did keep rejection letters and found one for the book that was rewritten and published 20 years later!) Reading this great good news is encouraging and inspiring and flat-out delightful. Mazel tov and naches! Thanks so much, Meredith. Keep going. Keep writing. Shawn, this is so inspiring! I’m incredibly excited for you, and encouraged to press on through this dry spell of my own writing journey. Thank you for being so candid and letting us share your journey! Hang in there, Alison. I think the writing life (for most of us) is made up of what feels like, or appears to be, dry spells. The rain will come. Thanks for your encouragement. Yes, Messiah! I love that place. It’s where Maile and I met. Katie, hang in there and keep writing. It sounds like you are constantly circling, constantly getting closer. Thanks for your encouraging words. So happy to read this. And I love this sentence: “I wonder if we can ever write the stories we’re supposed to write without those times of deep sadness and disappointment, rejection and loneliness.” Amen, sir. Also, I think I read “The Lion, The Witch, and the Wardrobe” at age 8. Maybe fifth grade for “A Wrinkle in Time.” If books like that are your early inspiration, then you’ll do just fine. I’m just so dang happy about this I can’t even think straight! So cool, Shawn. The heartiest of congrats to you. I followed a link from Emily Freeman and am so glad I did! Congratulations! I write middle grade, too, though my first sale was a “mere” 12 years in the making. ;). All my very best to you. Yay! Well done, Caroline. Thanks for stopping by. I’m new to the party. Where have you been? where have I? You’re a wonderful author whom I’ve only recently discovered, and this could not be more deserved for you. Well, you know what I mean… none of us, in one sense, deserves anything–it’s all God’s grace. And yet, we have to obey. We have to show up on the page. Seventeen years is a long time, and it’s really longer, going back to those sultry under-the-sheet, flash-lit nights. God has been preparing you all along. I’m so glad you were persistent, that you didn’t give up before God’s timing was complete. My own book (the solo one; I’ve done two compilations, too) was a ten-year dream-in-the-making. Looking back, I realize God had to kill my pride during those ten, long years, and it was also those painful experiences that I experienced which needed to be told in the book. Then God took it all away. I too obeyed. You obey to write. And you obey to stop writing. It’s all up to Him. It’s only recently that I sense Him telling me to write again. I don’t feel particularly obedient. Your post is that kind of hopeful prod that says get out from under the reading sheets and pick up your pen, and shine your pen-light. Put your words out there and be one little flashlight to dispel darkness. Sometimes sheets can masquerade as cloud, but sometimes as bushels, huh? Sooo happy for you–and especially for the resurrection of your book. God is obviously in this . . . the resurrection of old words, and the birth of new ones. Congrats on that three-book deal! Thanks for sharing your story, Lynn. All the best as you pick up the pen again. I am just so, so happy for you, Shawn! I got a little teary eyed reading this, knowing how much you’ve wanted this and all the twists and turns leading up to it. Thanks so much, Leigh. We are, all of us writers, on a long and winding journey. I hope to read a similar post by you someday soon.